In this episode, we are diving into the topic of stress. I mean, who doesn’t have stress in our lives, right? We all know that it is just a part of our every day, but how can we effectively deal with it? 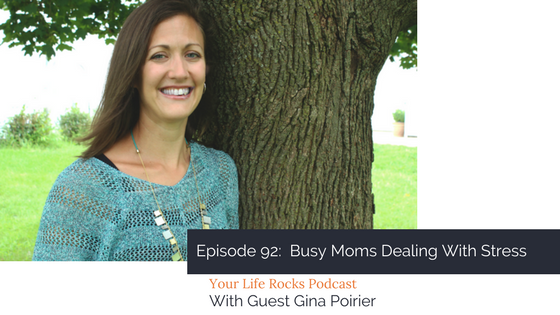 Gina has put together some great tips for us on this topic. I hope you have a listen as she shares her insight. Here is the outline of our conversation. 1. Create a healthy perspective about stress. Stress is not a bad thing. It was designed by God for our good. Once we can see stress in our lives from a neutral place, we can be better equipped to deal with it in a healthy way. 2. Know you can’t always control stress but you can control your stress response. Let’s talk about stress resiliency. As you begin to build up this up for yourself, here are the things to think about. Physical- Taking care of your body with good nutrition, staying hydrated, exercise, and getting the right about of sleep for yourself. Emotional/Mental- Setting boundaries, minimizing toxic self-thinking, working on better relationships, limit screen time. 3. Taking spiritual rest. God created us to do amazing things, but he also called us to slow down and rest. The Bible calls us to this over and over and God has set examples through nature and through his own actions as well. It’s about celebration and showing gratitude. So choose your Sabbath. Pray about it and see how God would have you implement this into your life. This episode was sponsored by Life Balance Membership. If you are serious about creating more balance in your life, start your free 7-day trial and try out the Life Balance system for yourself. Go to LifeBalanceMembership.com to get started.